Has anyone else noticed that their bathroom shelf has become almost indistinguishable from their fridge of late? Now don’t get me wrong, beauty has long borrowed from the food industry but it seems to have reached fever pitch this year – so that, browsing the Sephora website, as Hillary Bonhomme writing for New Food Economy points out, feels like shopping for groceries. 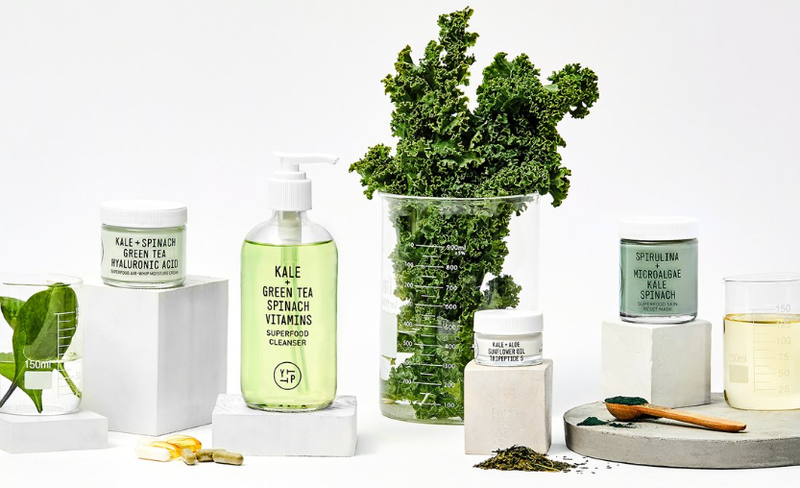 From avocado jelly masks, watermelon glow moisturizers and kale-infused cleansers, the latest launches certainly are bringing the produce aisles closer to the cosmetics shelves than ever – and, of course, we have the wellness movement to thank for that. Superfoods, a key component of skin care for as long as I have been working in this industry (cough, not going to disclose how long that is because it scares me, cough), have gone stratospheric. I pointed out the nascent trend on this very platform almost two years ago – and it’s now developed into a veritable movement. But there’s more to it than throwing in a handful of acai. So let’s connect the dots here. With the likes of spirulina, coconut et al forever linked to clean eating, they are also becoming synonymous with ‘safe’. And therein lies the motivation behind this almost universal adoption of the wellness language. Consumers see ‘kombucha’ and ‘chia’, and they think ‘harmless’. For in an era where teen make-up is alleged to contain asbestos and baby powder is said to cause cancer, don’t we all want to know a bit more about what we’re putting in and on our bodies? “The implication is that if food ingredients are used, the products are healthy and ‘cleaner’ than those with synthetic ingredients,” Amarjit Sahota, Founder of Ecovia Intelligence told New Food Economy. “It suggests the products are better for human health, and the environment. In a nutshell, the gourmet cosmetics trend has evolved, it’s no longer about the wondrous things these ingredients can do to our skin, but about what they’re not doing to our bodies. In short, it is part of the wider transparency movement. And, argues New Food Economy, it now goes even further still – we not only want our beauty products to come without a side of risk – and the inclusion of everyday foods help us to feel that they are – but we also want them to actively make us healthier (note, not just look better, be better). So in reality, it’s no longer simply a marriage of the food and beauty industry but now the pharma industry has jumped into the bed too. And that’s also why we’re seeing a proliferation of dropper-style bottles and prescription-strength topicals emerge. Enter the era of ‘well care’, described by Bonhomme as the place ‘where the shady world of nutrition research meets the aspirational universe of beauty products’. Sounds delightful. See you there?